Partially due to the lush, soft and feathery foliage that make up the pointed, needly leaves of the Leyland Cypress trees (cupressocyparis leylandii), they have become one of the most widely used species of trees in the residential and commercial landscape industries. Leyland Cypress trees are also very appealing to landscape firms and homeowners alike because the evergreen is a fast-growing barrier tree that provides privacy between close neighbors, an extra sound buffer from the interstate, a decorative hedge to beautify the front yard, and even windbreaks/screens to help slow soil movement from high winds . Leyland Cypress trees are fairly shallow rooted and are often not given adequate space to grow, making them susceptible to several canker and root rot diseases. Leyland Cypress trees can be affected by many types of canker diseases, but in Georgia, there are mainly two: Seiridium Unicorne and Botryosphaeria (Bot) Canker. Seiridium Canker is caused by a type of fungus and is the most destructive canker disease. Seiridium generally expands until the tree is destroyed. First symptoms to appear from Seiridium Canker include yellowing or browning of one or more of the top branches. Most people will notice begin to notice the discoloration in the Spring. Botryosphaeria Canker is caused by a different type of fungus and is not as destructive as Seiridium Canker. Bot Canker also affects several flowering trees and shrubs such as Redbuds, Dogwoods, Azaleas, and more. First symptoms to appear from a Bot Canker include rust colored branches and yellowing or browning of limbs. Leyland Cypress trees may also be affected by root rot diseases. Root rot is generally caused by either oversaturated or poorly drained soil. Excess water makes it difficult or impossible for a tree’s roots to get the air they require; this causes the roots to decay or rot. There are many types of root rot, including Armillaria, Phytophthoria, and Annosum. The symptoms of root rot may include: dark and visibly decaying roots, yellowing or browning of leaves, branches and limbs, apical decline, and, in severe cases, death. It is important to maintain the health of your trees for the sake of your home and property as well as other trees in the area. Infected trees can spread diseases to other trees in the same manner than people can spread germs and diseases. 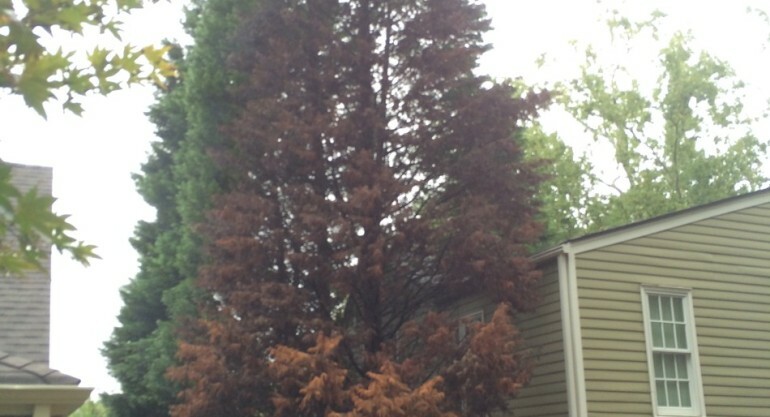 If you have any Leyland Cypress trees or other trees on your property that you are concerned about, give us a call (770-765-6555770-765-6555) or send us an email. Josh Correll is an ISA Certified Arborist and would love to take care of you and your tree healthcare needs.